A 10-day state of emergency has been announced in Mali following an attack on a hotel by suspected Islamist militants in the capital, Bamako, in which gunmen killed 19 people. President Ibrahim Boubacar Keita has also declared three days of mourning. Announcing the death toll, the president said two militants had also been killed. Al-Qaeda in the Islamic Maghreb and its affiliate, al-Murabitoun, said they carried out the attack. 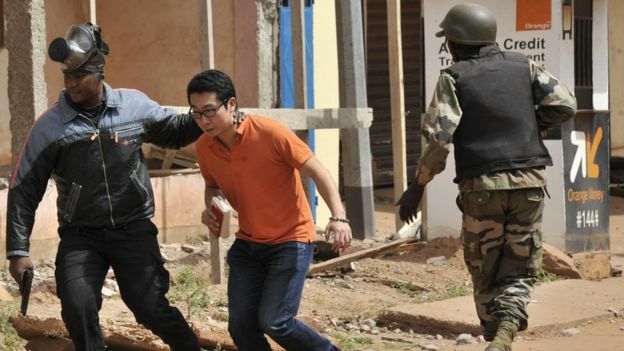 More than 130 hotel guests and staff were freed when Malian special forces, French special forces and off-duty US servicemen stormed the Radisson Blu hotel on Friday to break the siege. Among those killed were three Chinese business executives, and China’s President Xi Jinping has called the attack “cruel and savage”, Reuters news agency reports. A US national was also killed, and US President Barack Obama said the attack was yet another reminder that the “scourge of terrorism” threatened many nations. UK Foreign Secretary Philip Hammond said three Britons in the hotel were safe. President Keita said Mali would “do everything to eradicate terrorism” in the country. Earlier reports said at least 27 people had died. A UN official, who spoke on condition of anonymity, said 12 bodies were found in the basement and 15 on the second floor. It is not clear how many gunmen too part. Eyewitnesses said up to 13 entered the hotel shooting and shouting “God is greatest!” in Arabic – however the company that runs the hotel, Rezidor Group, said on Friday that only two attackers were involved. The claim by the Saharan jihadist group allied to al-Qaeda that they were behind the attack is a reminder that the country still faces an insurgency, says the BBC’s Frank Gardner. In 2013, French forces managed to reverse the takeover of much of Mali by Islamist militants. But it is a large country with porous borders and areas of ungoverned space in which jihadist groups have been able to hide and plan attacks, our correspondent says. It has not been helped by the ease with which weapons can come across from Libya, nor by the proximity of a murderous insurgency in Nigeria. France, the former colonial power in Mali, intervened in the country in January 2013, when al-Qaeda-linked militants threatened to march on Bamako after taking control of the north of the country.